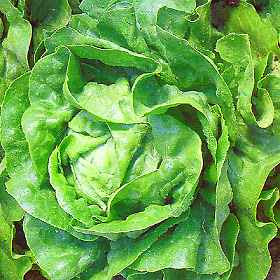 The lettuce has reasonable quantities of vitamin A, niacin, C and the minerals calcium, phosphorus and iron. Vitamin A is an important element for the proper functioning of eye, preserves the health of the skin and mucous membranes, the vitamin niacin avoids problems of skin, the digestive tract and nervous system, and the vitamin C provides resistance to blood vessels, avoids the fragility of the bones and bad formation of teeth, acts against infection and helps heal the wounds. Medicinal Properties: Leaves - Arteriosclerosis, nephritis, urethritis, haemorrhoids, bronchitis, arthritis, gout, acidosis, eczemas, and diabetes. For internal use, salads can be consumed daily, or in the form of tea in the proportion of 100 g of leaves to 1 litre of water and drink up to 3 cups daily. Stems - Insomnia, palpitation, flu, rheumatism, irritability, Cough - Taking juice, 1 to 3 times daily. Asthma - Cooking 50g of stems to 1 litre of water and 1 cup taken shortly before bedtime. Leaves and stems - bronchitis with cough and secretion - For internal use, add 2 heads of lettuce with the stems in 1 litre of boiling water until the water evaporate by half of its original volume, and sugar or honey. Take 1 cup 4 times daily.